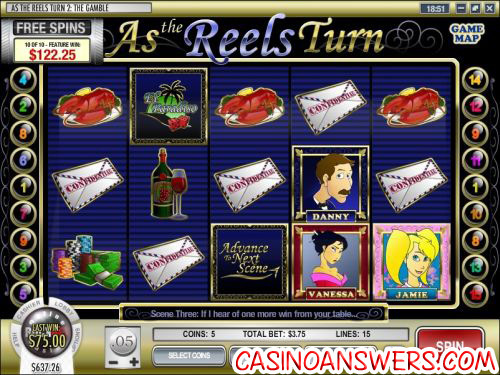 As The Reels Turn 2 ISlot Guide & Review - Casino Answers! As the Reels Turn 2: The Gamble is a 5-reel, 15-line iSlot-branded video slot developed by Rival, featuring four scatter symbols, a free spin feature with a multiplier and four bonus games. You can play episode two of As the Reels Turn: The Gamble at Bovada. Coin sizes available on As the Reels Turn 2 are $0.01, $0.05, $0.10, $0.25, $0.50 and $1. You can bet up to 5 coins per line and play up to 15 paylines. The lowest possible total bet you can make on As the Reels Turn is a penny per spin and the highest is $75 per spin. There is an autoplay mode available for real money players only. To play all 5 coins with all 15 paylines selected, hit the “Bet Max” button. For other bets, use the “Spin” button. The two highest paying symbols on the As the Reels Turn 2 slot game are the El Paradiso logo and the Cashino Chips symbol. Both of these jackpot symbols pay up to 1000 coins. The Ivan scatter symbol pays out 1X for 3 symbols, 2X for 4 symbols and 50X for 5 symbols. If 3 or more Ivan symbols appear anywhere on the reels at the same time, you will get 10 free spins with a 3X multiplier. The free spins feature can be re-triggered. If you hit a bonus game during the free spins feature, your bonus game winnings will be multiplied as well. As the Reels Turn: The Gamble is broken down into several different scenes. If you hit 3 or more “Advance To Next Scene” scatter symbols anywhere on the reels in the first scene of As the Reels Turn 2, you will be sent to the next cutscene. After the cutscene, you will get to play the first Find Val bonus game where you have to pick out the Wanted posters which are Val. If you accidentally pick out one of his twin brother Sal’s posters, the bonus game will end. This is only the first of many different bonus games you can play on As the Reels Turn at Bovada. During any scene of As the Reels Turn 2, if you hit 3 Bonus symbols, you will trigger the Cashino Chip bonus round. The Cashino Chip bonus game is identical to the one in As the Reels Turn: Episode 1. All wins are multiplied by the bet per line, except for scatters. All wins pay left to right, except for scatter symbols (which pay any). Scatter wins are multiplied by total bet and added to payline wins. As the Reels Turn 2 is more of the same of the first installment, which in this case is a very good thing. The storyline is well done with a bunch of different bonus games to play along the way. The free spins feature with the 3X multiplier will win you a ton of Cashino chips. To play As the Reels Turn 2: The Gamble, head on over to Bovada! Can USA players play As the Reels Turn for real money? Is there a free Flash game of As the Reels Turn 2 available? All of Rival’s casino games are available in Instant Play format for players with Macs or who wish not to download the casino software. If you experience any issues with the Flash slot game, try downloading the latest version of Adobe Flash Player. How do I trigger a bonus game on the As the Reels Turn 2 slot game? There are many different ways to trigger a bonus game on the As the Reels Turn interactive slot game. The first is to Advance to the Next Scene by hitting 3 Advance scatter symbols. 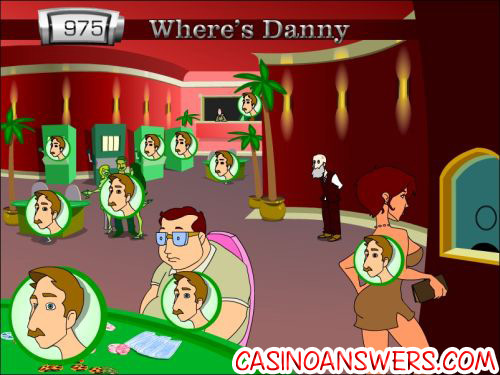 The second is the Find Danny bonus game, which you will get when 3 Danny symbols appear anywhere on the reels. Finally, if you hit 3 Bonus symbols, you will play the Cashino Chip bonus game. How does the As The Reels Turn Interactive Slot Work?